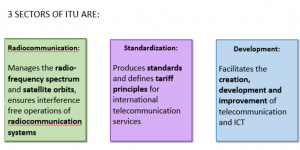 ITU allocate global radio spectrum and satellite orbits, develop the technical standards that ensure networks and technologies seamlessly interconnect, and strive to improve access to ICTs to underserved communities worldwide. ITU is committed to connecting the entire world’s people – wherever they live and whatever their means and to protect and support everyone’s fundamental right to communicate. ITU was founded in Paris in 1865 as the International Telegraph Union. It took its present name in 1934, and in 1947 became a specialized agency of the United Nations. Although its first area of expertise was the telegraph, the work of ITU now covers the whole ICT sector, from digital broadcasting to the Internet, and from mobile technologies to 3D TV. It is an organization of public-private partnership since its inception. Currently, it has a membership of about 192 countries and some 700 private-sector entities. ITU is headquartered in Geneva, Switzerland, and has twelve regional and area offices around the world. TIES (Telecommunication Information Exchange Service) is a set of networked information resources and services offered by ITU without any charge to ITU Members (Member States, Sector Members, Associates, and Academia) to support their participation in the activities of the Union. TIES accounts are provided, on demand, to staff from ITU Members (Member States, Sector Members, Associates, and Academia). 1. 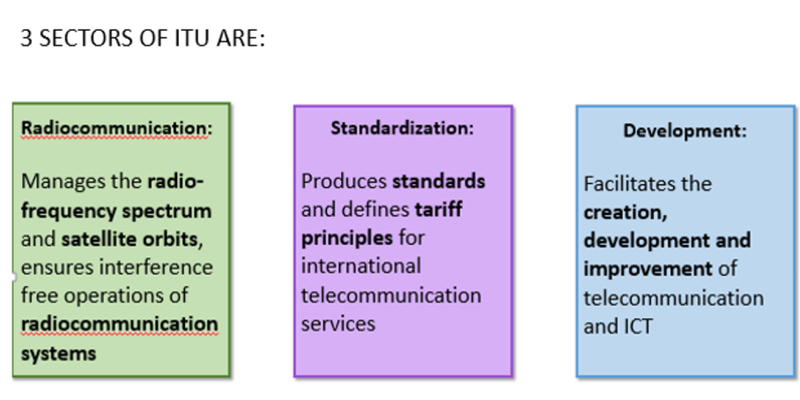 STUDY GROUP: are were Standardization work is carried out in which representatives of the ITU-T membership develop Recommendations (standards) for the various fields of international telecommunications. 3. WORK ITEM – an assigned piece of work which is identifiable with a question and which has specific or general objectives, which will result in a product, usually a Recommendation for publicity by ITU. 4. WORK PROGRAMME: A list of work items that are owned by a study group. Contributions to ITU work can be in the form of – Amendments, annex, appendix, clause, corrigendum, implementation guide, supplement, text etc.